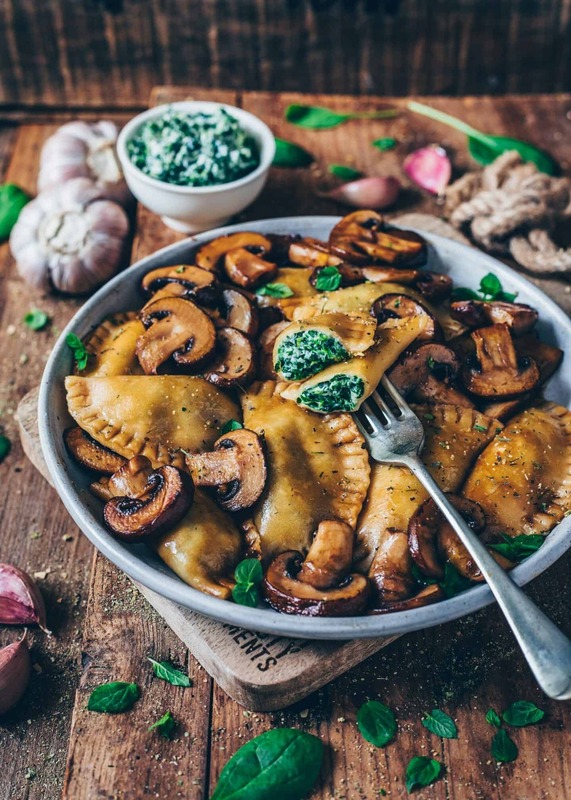 These homemade vegan spinach ravioli with fried mushrooms is the ultimate comfort food. It’s a simple recipe that is delicious and healthy. There is nothing better! 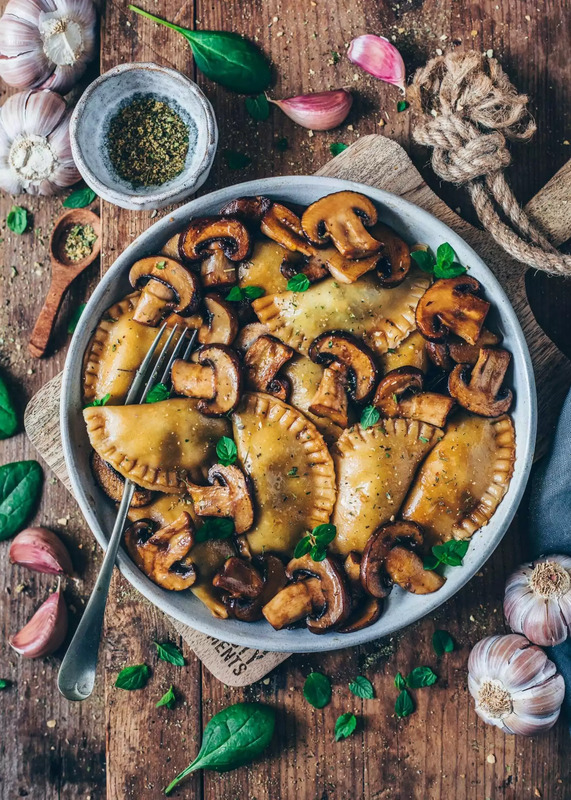 I LOVE this ravioli recipe and, honestly, I could eat it everyday! It’s just perfect, super creamy and tastes incredibly delicious. You don‘t need dairy products – just a few simple, plant-based ingredients. 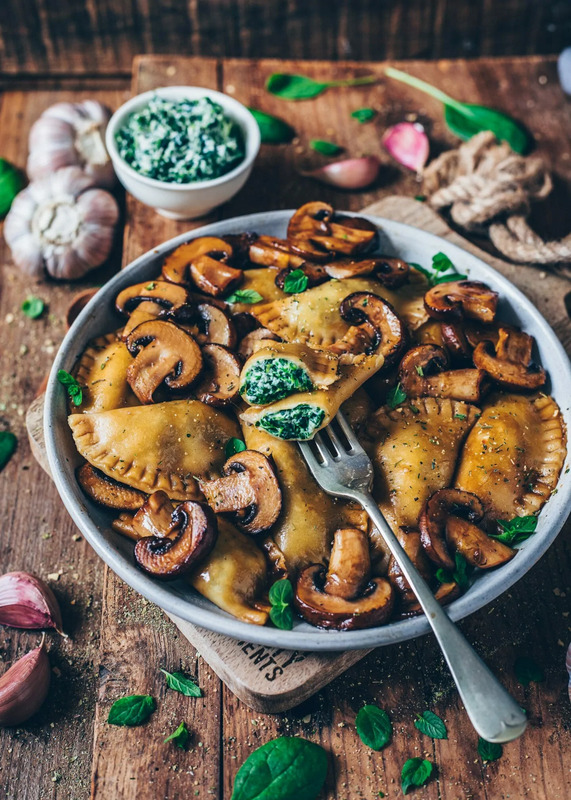 The flavorful fried mushrooms are such a great addition to the fresh spinach filling of these homemade ravioli. I don‘t know how many times I‘ve made this dish already. Anyways, I can‘t count it on 2 hands anymore. 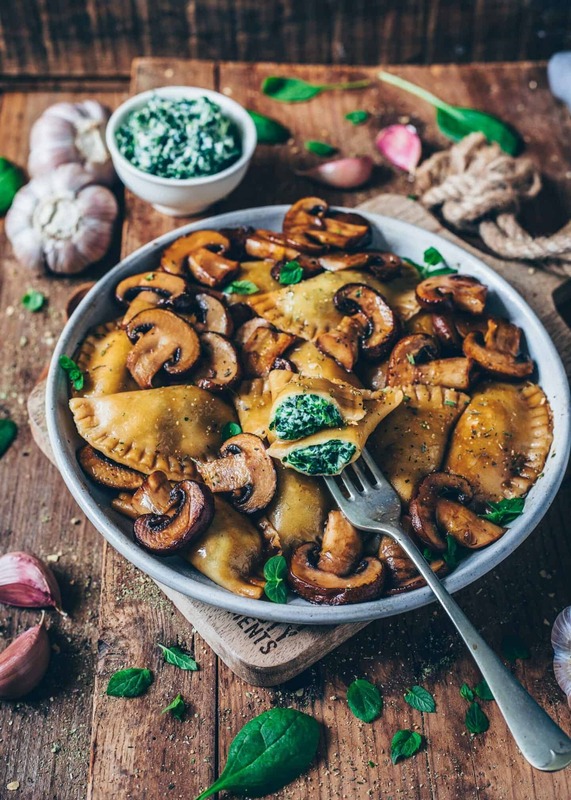 If you love pasta, spinach and mushrooms, this is your recipe! 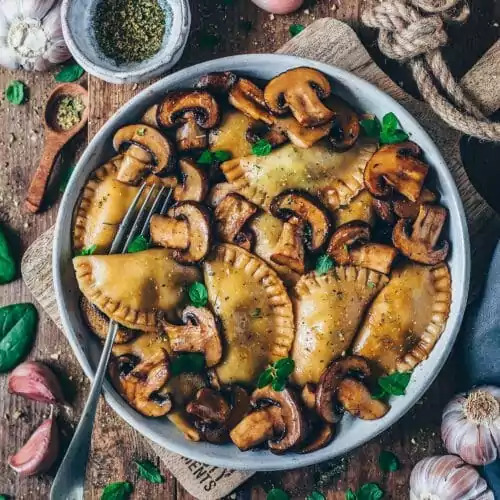 These are maybe not the prettiest ravioli I’ve ever made but, somehow, I think they look so much more cozy and inviting in this shape. I mean, they’re homemade, made without any special kitchen equipment. You don‘t need a ravioli cutter, just a round form, such as a glass or a cookie cutter. Also, a rolling pin but a simple bottle would do it as well. And regardless of its beauty, most importantly, it’s easy, delicious, and I’m pretty sure you’ll love this recipe as much as I do! Homemade vegan pasta dough is made quick and easy! 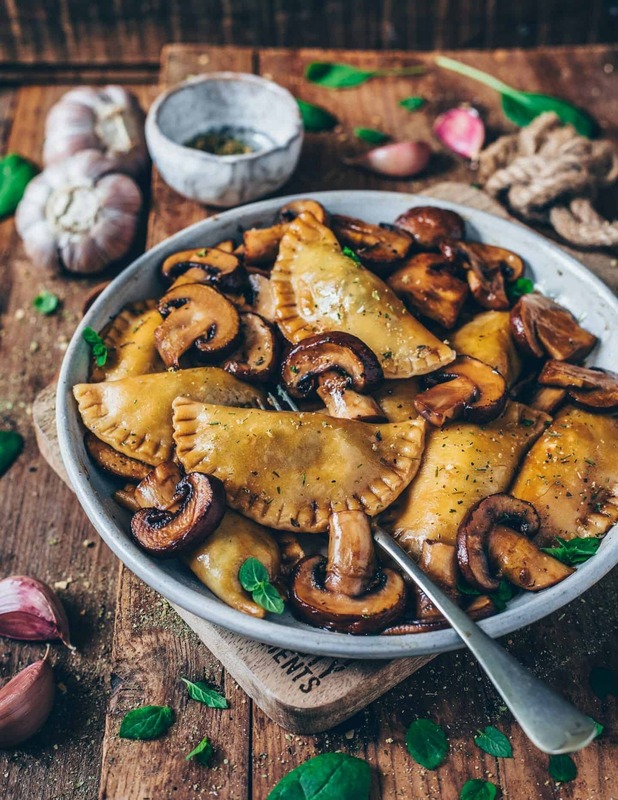 Believe me, it’s really worth to make your own pasta dough for ravioli! 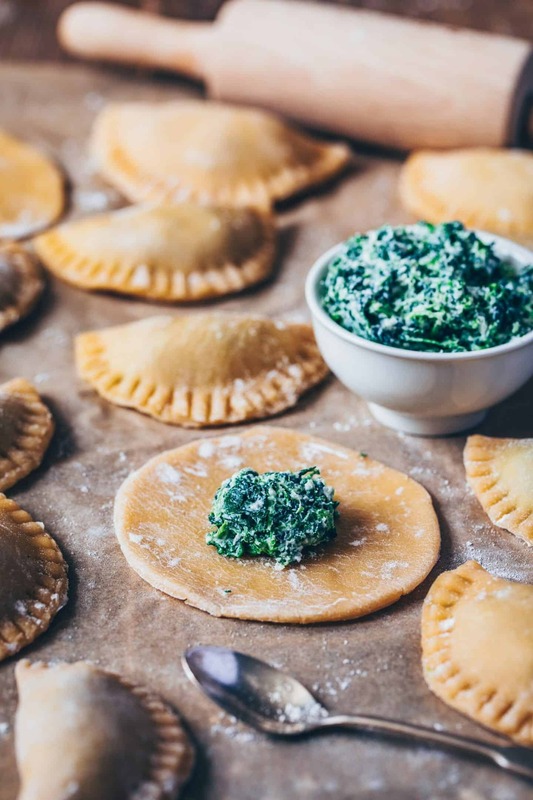 This is super simple and it tastes so much better than store-bought ravioli. You’ll probably have all ingredients at home, because you need only flour, semolina, salt and a little bit of olive oil. That’s it. Try it out! You‘ll be surprised how soft they are after cooking. Shop bought ravioli doesn’t come close to fresh homemade ravioli. I don’t want to bore you again with how much I love spinach, but I can’t help it, I really adore it! 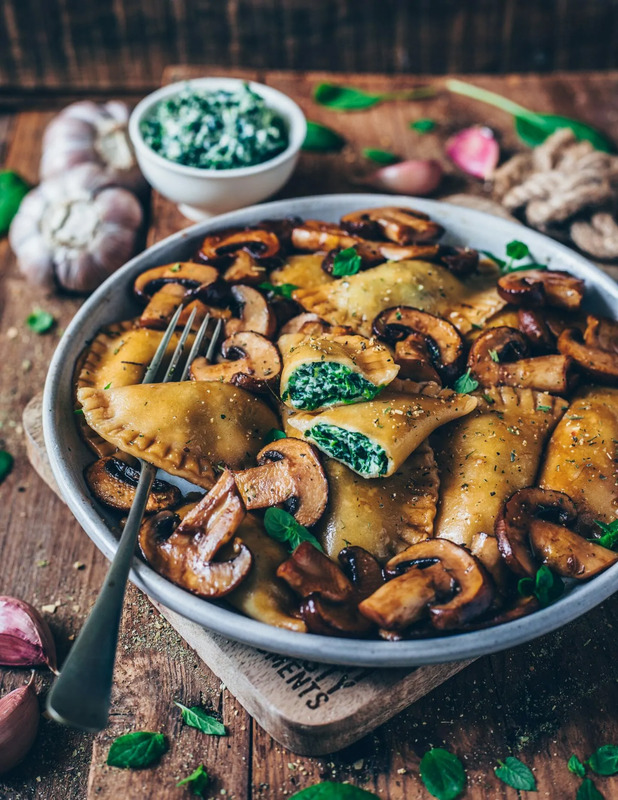 Spinach is healthy, tastes fresh and is perfect as a filling for many dishes, such as Empanadas, Croquettes, Stuffed Pasta Shells, Spinach Wraps and more . It’s especially delicious combined with creamy dairy-free cream cheese or cashew ricotta. I could really dive into it! Often, I serve ravioli with a simple tomato sauce or with my beloved vegan cheese sauce (Mac and Cheese). But actually, I like them best served with mushrooms. I just fry the mushrooms in hot olive oil. Then I add fresh chopped garlic and deglaze with a bit of soy sauce. Then I reduce the heat and simmer mushrooms for a few minutes longer in the soy sauce. So they unfold spicy flavors which add an amazing taste to any dishes! 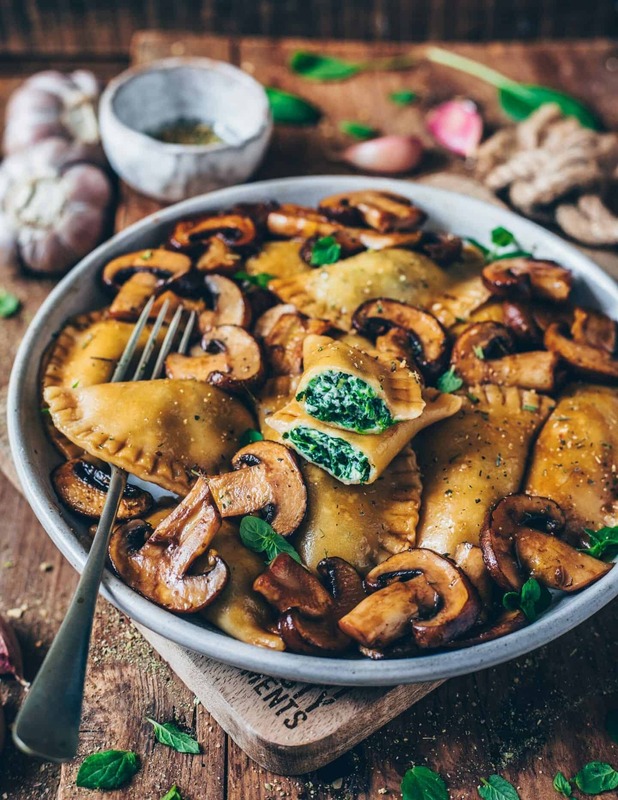 These homemade vegan spinach ravioli with fried mushrooms is the ultimate comfort food. It's a simple recipe that is delicious and healthy. There is nothing better! Mix the flour, semolina and salt. Heap to a pile and press a well into the center. Pour in water and olive oil and knead to a smooth dough. Then shape the dough into a ball, wrap in cling foil and place in the fridge for at least 1/2 hour. Thaw spinach, squeeze to remove excess water and chop. Roll out the prepared pasta dough thinly on a lightly floured surface. Cut out circles with a round form (such as a 3-inch glass or cookie cutter). Place approx. 1 tbsp of the spinach filling in the center of each circle. Brush the sides with a bit of water and fold over the filling into half circles. Carefully seal with your fingers and then press down lightly with a fork. Bring salted water to a boil in a large pot. Let the ravioli slide in and simmer for 3-4 minutes until they float to the surface. Then remove with a foam ladle and drain. 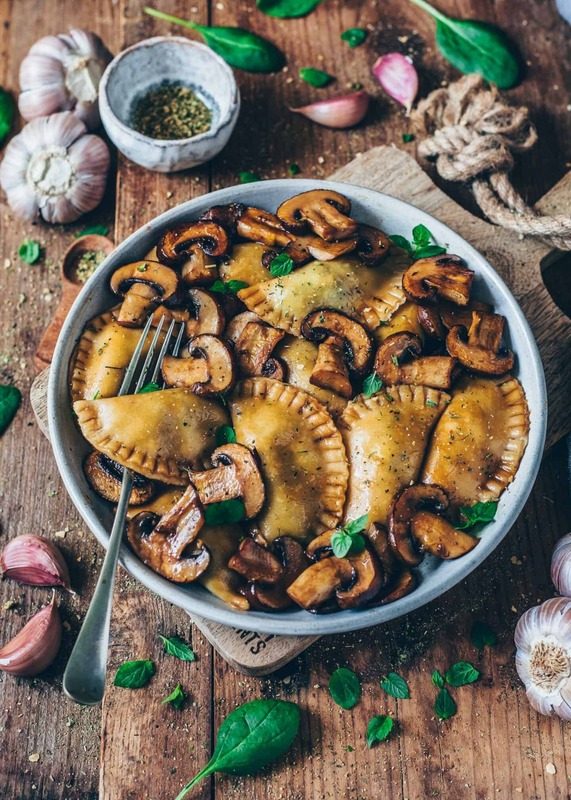 Heat the olive oil in a pan and fry the mushrooms for about 3 minutes until lightly browned. Add chopped garlic and roast for approx. 30 seconds longer. Then deglaze with soy sauce, reduce the heat and sauté for further 2-3 minutes. To make the pasta dough, you can use wheat flour, spelt flour or a gluten-free flour blend. The filling can be varied as you like. Instead of plant-based cream cheese or cashew ricotta and parmesan, you can also use vegan feta or any other grated cheese of choice. You could also use a ravioli cutter to make them. If you want to make the ravioli ahead, you should cover them with a damp towel, otherwise they will get dry. 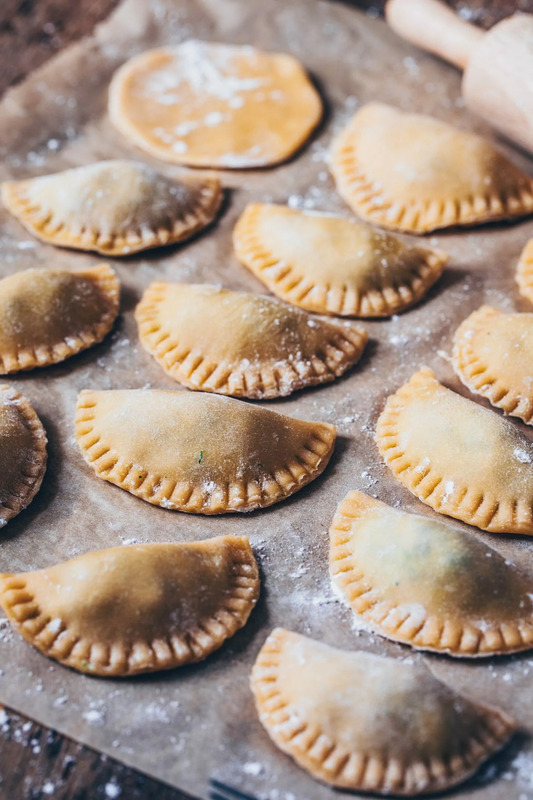 The ravioli are also great for freezing in batches. 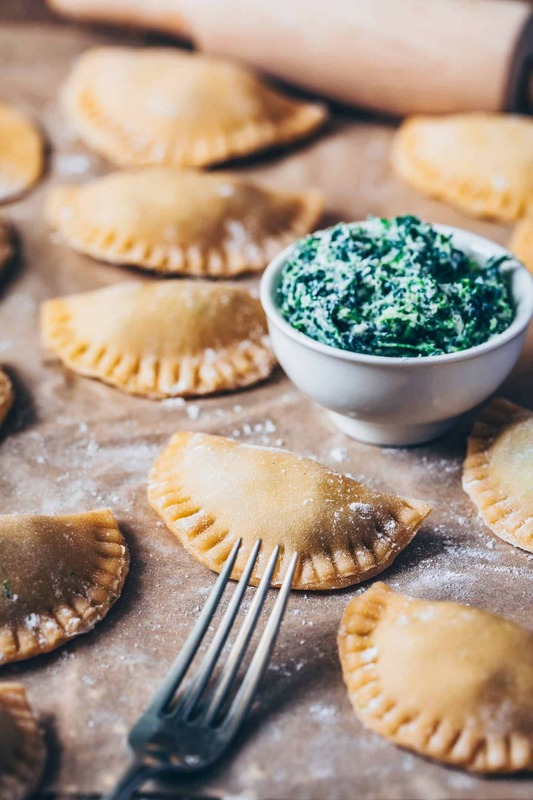 These spinach ravioli look so good, Bianca! I love the healthy filling. It looks so yummy and pretty! So glad that you like them. Do I need to use the semolina flour? Or could i just use regular flour instead? You could also sub more regular flour, of course. Will it still taste good if I make the dough a day ahead? Yes, it’s possible when you cover the dough with a damp towel. But it‘s best when fresh. This looks incredible!!! Do you have a substitute for soya sauce? I’m vegan but my new housemate is deathly allergic to soy! Thanks for your help. You can omit the soy sauce. Simply season with pepper and salt. Replace the soy sauce with a good pinch of salt, a squeeze of lemon juice and some thyme, it will be way nicer than the soy sauce regardless. Will try it as well. I made this last night and it was a hit! My only flaw was that I didn’t roll them as thinly as I should have, but the filling made up for it! I was surprised by how easy it was to make this (first time making ravioli). I think because it is in three parts and then put together it makes it manageable. I really liked this recipe and will definitely make it again! So happy that you liked this recipe! 😊 I‘m sure they‘ll be even better next time when you roll out the dough more thinly. You could also vary the filling to your wish. Super yum and easy recipe!! We loved it! This recipe is fantastic! 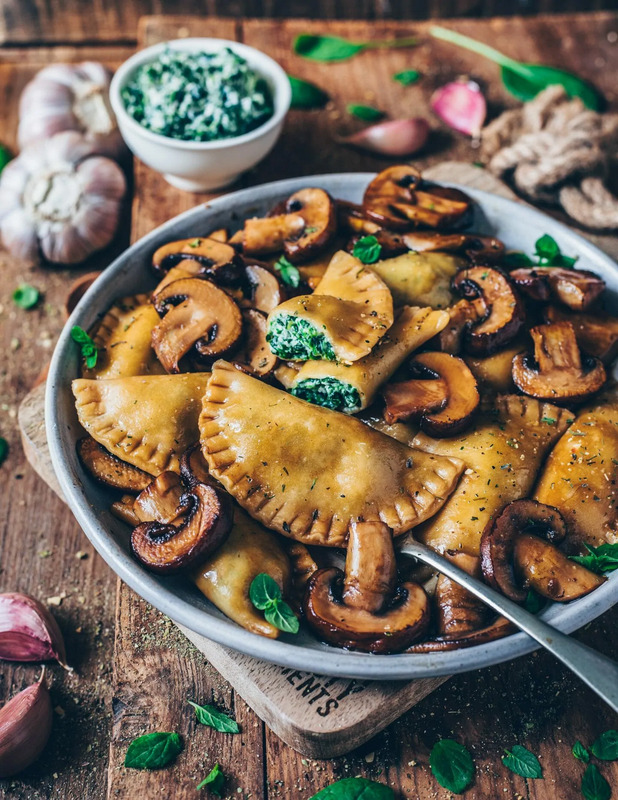 I made up my own filling for the ravioli (butternut squash, cashew cream and seasonings) because I didn’t have spinach, but the pasta recipe and directions were great and the mushrooms MADE the dish! I used a pasta roller which definitely helped with the thinness and my circle was a little small so I used two circles and made round ones instead of folded (made it easier to get a good amount of filling in). Oh and I used all All Purpose Flour because that’s I had. I might try semolina next time if I have it! These are so impressive! I love making healthy versions of classics and this recipe is soooo perfect! Thank you Bianca for this recipe!!! My husband says thanx too, we absolutly LOVED it. Very nice for a sunday fun team work in the kitchen. Simple healthy ingrediens and not at all complicated to make, even though I never made ravioli before. Made the dough with spelt flour and semolina, it come out great. Spinach filling is out of this world. I mean, I love spinach, but this combination of flavours is beyond anything I tryed before. Will most certainly make it often from now on and I suggest everyone else try it too! What a culinary experience! Thank you, Bianca! We will be making more of your recipes for sure. So glad to hear that you like these ravioli! These look amazing. You mention freezing these and I was wondering if you’d freeze them before boiling or after. They look so good I want to make them for my vegan daughter but never know when I’ll see her. Thanks! You can cook them immediately or freeze them for another day. Thanks! Will let you know! The filling was absolutely delicious, so much better than store bought ravioli which contain dairy. Now because this was my first time making ravioli I made them a little too thick, next time I will have to roll my pastry even thicker, but they were delicious all the same and the tip about waiting for them to rise in the pan of boiling water was amazing. So glad that you liked this ravioli too! You could also vary this recipe and make another filling if you prefer. It’s also one of my favorite dishes.